This past year, I’ve become good at bread making. 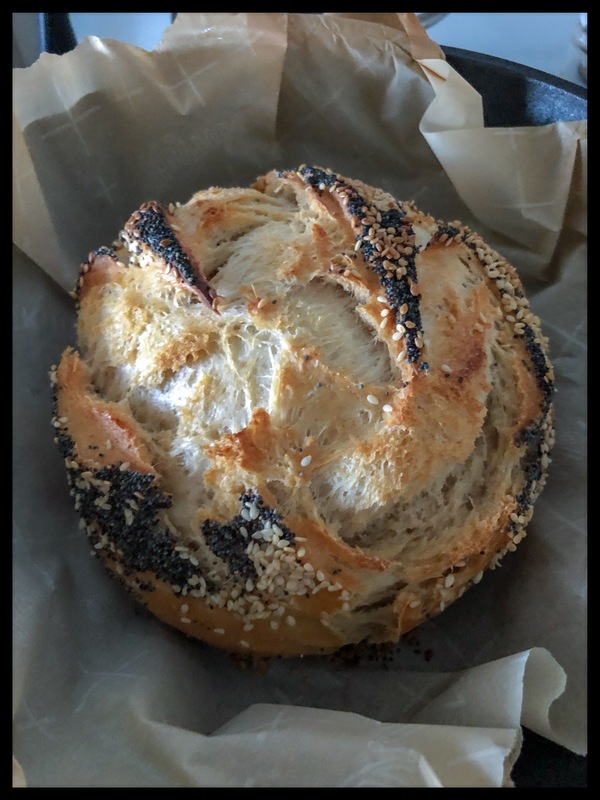 I’ve learned a book’s worth at the intersection of life and the art of bread baking — but for this entry, I’d like to suggest that bread is a singular metaphor for the embodied spiritual life. Good bread is in large part about fermentation and yeast. For the past seven years, I’ve home fermented fruits, veggies, nut cheeses, kombucha, and kefir. There’s interesting stuff going on in playing with bacteria and yeasts that even a novice can appreciate. Fermentation’s fizzies and bubbles, its yeasty smells, the way sugars change into alcohol, and the transformation of one food matter into a more interesting and healthier one. I read somewhere that bread is a cooked foam. What creates the foam is yeast, that is, the gases formed by bacteria. In sweetened liquids, or fruits and veggies, the gases are fizzy, acidic goodness; in bread, it’s flour and water filling with air. Instant yeast is a quick way to raise bread dough. But I discovered that dry active yeast that’s allowed a slow rise creates a more satisfying, complex flavor. Instant yeast is fine for some kneaded recipes, but I’m not a fan of it for crusty artisan loaves. Sourdough is the fermentation queen, and its bubbly, sour goodness requires the most time and attention to mature. Notice the curve: instant, active dry, sourdough. Google tells me there’s no difference between instant and dry active, only the granule size. I’m skeptical. What I know, though, is that the longer and slower the process, the better the result, even with instant yeast. Or, more precisely, time allows the yeast to give depth and complexity to the final baked foams. Perhaps kneading was the secret for Mom’s holiday cinnamon rolls whose success depended on the comforts of The Betty Crocker Cookbook’s soft, white, refined, and sticky sweet same day rise and bake recipe. But the lazy person’s slow rise rustic bread requires less work if more time. It’s easier because bacteria do the work — and letting nature do the work is always a good thing. For the first few months of my bread making, I made the popular New York Times ‘No Knead Bread’ recipe. I noticed that a longer fermentation time, say, extending the recipe’s suggested sixteen hours to thirty-six or forty-eight hours in the refrigerator, resulted in a noticeably tastier loaf. A few months into my experiments, Amazon sent me an email promoting an artisan bread book for .99. Turned out this book is a popular standard in no-knead artisan bread baking. ‘The New Artisan Bread In Five Minutes’ confirmed my experience about a long, slow rise for flavor. The authors also led me to my next bread making step: I now have a six-quart bucket in my fridge that always has bread dough ready to go. Now, here’s where the story gets glutinous sticky. If you’re patient and allow for a slow rhetorical rise, you may enjoy the final outcome. A loaf of bread costs little to make — the electricity probably costs more than the ingredients, even using quality, organic flour. But baked foam is more than the sum of its simple parts; delivering a mound of homemade bread brings the now near forbidden ecstasy of carbohydrate delight and a little heaven on earth. This fermentation goes beyond family, friends, and neighbors; it’s ancient, written in the earth and, I believe, our DNA. When I place a moist mound of dough on a piece of parchment paper, I take part in thousands of years of human bread making. Last year, the oldest known bread was discovered in Jordan. Researchers found and dated crumbs of charred bread — probably a predecessor to pita — dating back 14,400 years. Scientists now hypothesize that bread predated agriculture, implying that our great, great, great, great, greats reveled in bread so much that the love of bread’s starchy satisfaction may have led to human agricultural development. Bread making ferments the past to the present — the 21st-century experimental baker in her Maine kitchen joins hands with those living in Jordan 14,400 years ago. The simplicity of earth, air, fire, and water binds humans together loaf by loaf. From our ancestors’ discovery of fire, the first ideas of roasting and grinding grains, the beginning of land cultivation, and thousands of years of yeast experiments — humanity’s stories stick together in bread’s history. I bake my loaves early in the morning so they are fresh when I give them. In the winter, I’m usually up by four a.m., so there’s a meditative quiet surrounding the ritual: turn on the oven, put the cast iron Dutch oven in to heat, cover a cutting board with parchment paper, dust parchment with cornmeal, remove bucket from fridge, break off sticky dough ball, form boule, dust with flour or seeds, then decoratively score. When the oven hits 500 degrees, I take out the Dutch oven, place the parchment paper with boule in it, place the heated cover on it to steam, turn down the temp to 450, set the timer for 35 minutes. That’s it. I do this in my modern if small kitchen, with the luxury of an electric oven, running water, a sturdy cast iron oven that American workers in Tennessee crafted — it’s a Dutch oven that I’ve named ‘Glory’ as an homage to its modest yet sturdy grandeur. This morning I performed my ritual as a stunning sunrise silently serenaded me from the back window. Flour, yeast, salt, water, oven, and sunrise. Flour and iron: earth. Yeast: air. Oven: fire. Salt and water. Earth, air, fire, and water. Today these came together under the eternal return of the morning sun. The same sun that has sustained earth — plant, animal, insect, all living beings known and unknown — since before humans made bread. The same sun that those hands 14,400 years made bread under. Making bread is deeper than consumption — it’s connection. And it’s a connection that extends beyond friends and neighbors to civilization and metaphor. 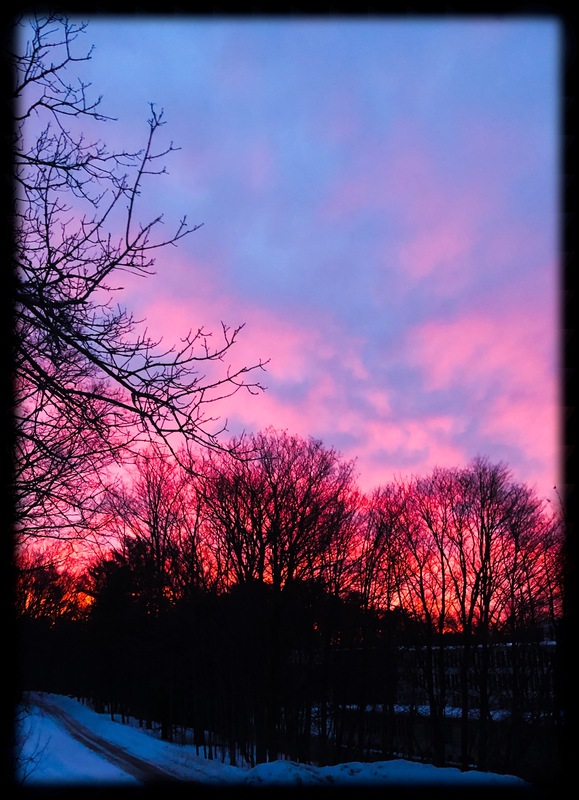 This morning, under the sun’s surreal poppy-pink and coral-orange rising, because of the season, it was impossible for me not to think of Lent and the Last Supper. Bread, leaven, and unleavened bread are central metaphors in the Jewish and Christian traditions — Passover, manna in the wilderness, cast your bread upon the water, “a little leaven leavens the whole lump of dough,” “I am the bread of life,” and, of course, communion. “the model [of communion as eating God’s body] does not reduce God to the world nor relegate God to another world; on the contrary, it radicalizes both divine immanence (God is the breath of each and every creature) and divine transcendence (God is the energy empowering the entire universe). Finally, it underscores our bodiliness, our concrete physical existence and experience that we share with all other creatures: it is a model on the side of the well-being of the planet, for it raises the issue of ethical regard toward all bodies as all are interrelated and interdependent. . . .” (full meditation here). Communion — breaking bread and sharing wine — becomes the radical sacrament (the allusion to cannibalism would have been a discombobulating heresy to ‘the twelve’) given by the man who lived 2,000 years ago because through earth, air, fire, and water it elementally embodies and metaphorically points to our participation in eternal Divine union, a union that exists here and now, whether or not we are aware of it. While people who rely on literal readings may venerate the sacrament’s broken bones and blood narrative, I’m not convinced that’s the whole of the teaching, or even what he wanted to convey. I believe there’s a deeper redemption in eating and drinking God than meditating on suffering: celebrating Love’s thick, delicious, intoxicating joy, a Love so expansive that it resurrects in us, and living the immutable reality that we’re always participating in that Love. Our awareness — our “digestion,” our turn toward the inner, conscious life — of this participation in and with the Unknowable but always present Love is our ground of Being, the rich, silent soil that radically transforms us, and thus ferments a celebration greeting us with every sunrise. The authors of ‘The New Artisan Bread’ describe a bread making technique called pâte fermentée (fermented dough). When nearly down to the end of the bucket, leave some dough in the pot, and then scrape down the bucket sides. Add the new batch’s warm water, salt, and yeast, then stir until the old dough is dissolved. Flour next, stir again. The new batch is ready to rise, with no clean-up, and a nice mature starter folded in. This method has several benefits: no waste, no bucket cleaning, and the old dough gives complexity to the new batch. A little leaven. Not much is needed. What is needed, though, is time. Time is a gift, and if we knew how to sink into the moment, we’d be better at relishing time’s preciousness, instead of seeing it as our existential enemy. “Eternity,” wrote William Blake, “is in love with the productions of time,” but we’re so preoccupied with racing the clock that we overlook Eternity’s voluptuous, tireless yearning for our attention. Instead, we ignore the present and head into battle. We battle time in our unconscious preoccupation with the race to the grave, we battle time in our anxiety to pay the next due payment, we battle time in crazy race planning for our future and ‘retirement,’ we battle time to get to the next thing on our bucket list, or we battle time in our fear it will cheat of us our creative flourishing, fearing that self-actualization ala Maslow’s hierarchy will be permanently robbed from us. As if our personal angst isn’t enough, scientists have constructed a “Doomsday Clock” to remind us that the human species is running out of time if we don’t change our ways, now. The Doomsday Clock: tick tock, tick tock. I suspect, though I haven’t researched it, that our transition from the sundial to a round analog clock paralleled the sun and its movements. But we ditched the sun for the sundial, the sundial for analog timekeepers, and the clock’s orb face and circular movements for digital numbers. Though we race through the days, digitally ticking down each one within the necessary artifice of the Gregorian calendar, our resplendent sun has never once failed to rise. We believe in the myths of more and faster and never enough, as though the sun’s shortchanged itself and the world by showing up only once a day. Time is not our enemy; time bestows a lover’s gifts in every moment, over and over. Time is where Eternity meets us, in the opulence of all that is right before us. Sometimes we hear Eternity’s heartbeat in stillness, and other times it unfolds before us in grand gestures of earth, air, fire, and water come together in splendid ways: a sunset over the mountains, the trees first budding, a gathering of fat red-breasted robins foraging for food, the sparkle in a friend’s smile, a child’s curiosity, in any and all these gifts, Eternity deeply, reverently loves us in time’s productions. Our enemy is not time. Our enemy is fear. Our enemy is a belief that we don’t have enough time, we don’t have enough money, we don’t have love, we don’t have what it takes to dance to the music in our hearts. We fear we are not enough. Time does not derail us, fear does. Fear keeps our thoughts anxious, our hopes unrealized, our creativity thwarted. For while we’re making ourselves distracted, sick with worry, or heartbroken from missed expectations, who we are and what we need already exists, in the present moment, if only we believed. One of the major New Testament parables is usually read as a miracle story. That’s fine, but I think it’s better to read it metaphorically, and put aside the quibbling over its literal truth and sources. The masses were hungry. Dealing with the so-called facts, the disciples wanted to send the hungry away. The master told them, “you feed them.” Dealing only with the facts, they questioned the master, who told them to put two fishes and fives loaves into baskets (depending on the version). They did as they were told, the fishes and loaves multiplied, the crowds ate until they were satisfied, and the disciples collected baskets of leftovers. This may have been a miracle, but it contains another truth: faith that there’s always more than enough. This is a story of abundance born from scarcity; it’s a story about changing from a consciousness of lack to generous overfill . Faith in provision, faith that our deepest emotional, spiritual, and creative yearnings will be met, as well as our material needs, when we exercise faith in something beyond ourselves, for something beyond ourselves. Faith in time, and faith that life deeply meets us moment by moment. This is the bread of life, where Love meets the heart and life open to its gifts, while believing in the goodness of things seen, and believing in the reality of things still unseen. A loaf of bread, a powerful if simple elemental pointing to Eternity and its infinite productions.